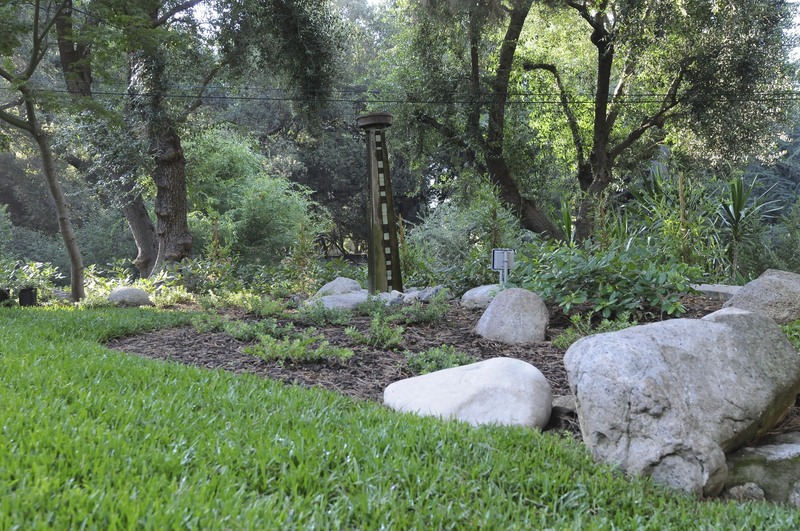 In the images below, you will get a sense of overall planting scheme and design. 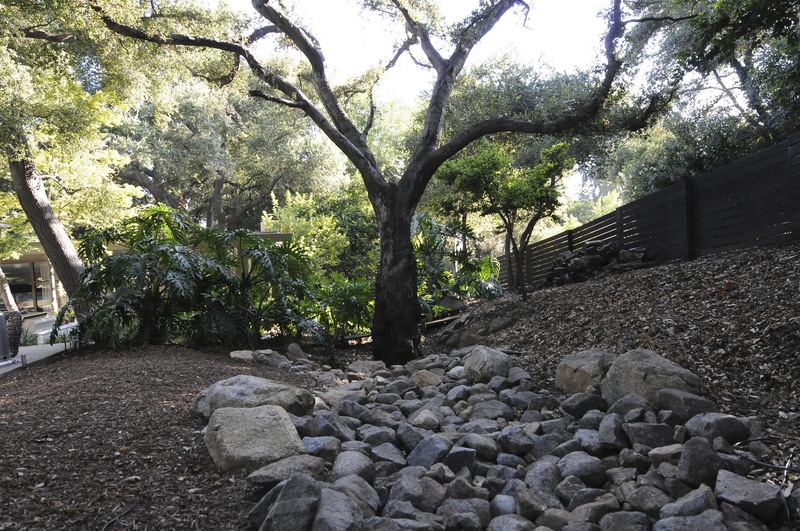 Our gardens are all about the Oaks. 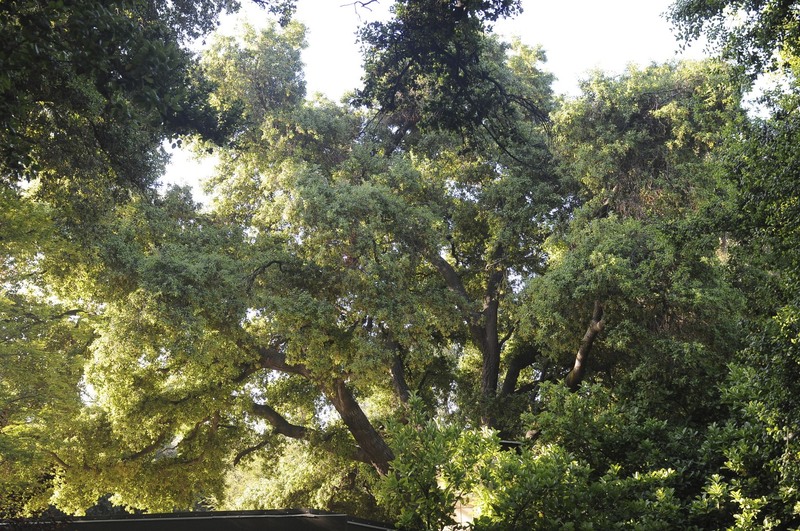 Here, the canopy of a Coast Live Oak (Quercus agrifolia). 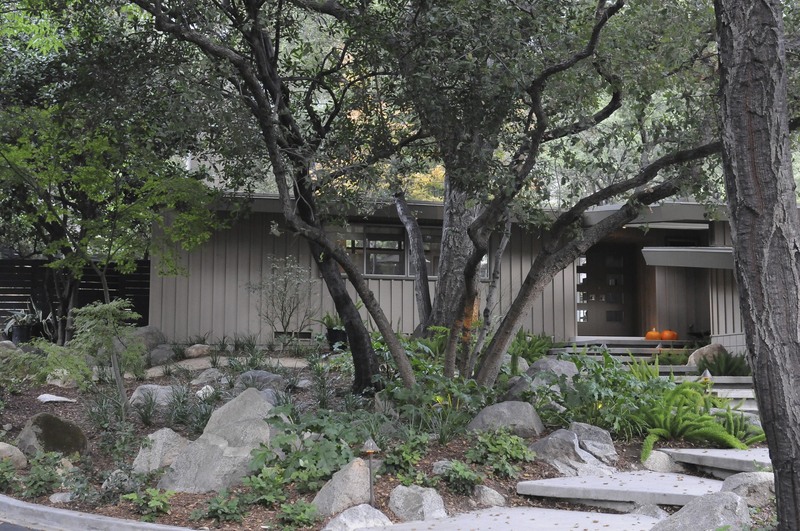 The gardens require a constant awareness of the Oaks — of which there are 30. The Oaks dictate the plantings beneath them — little sunlight, and care not to plant water sucking plants because Oaks don’t tolerate wet “feet” — particularly in summer. Zone 3: Taken in 2011, looking to Zones 9 and 10. Lots of conventional San Augustine turf. See next photo for replacement grasses. 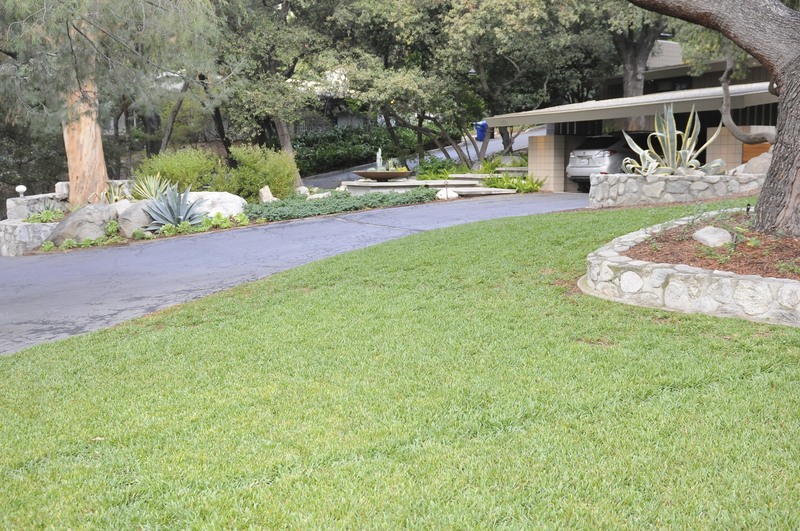 Zone 3: Taken in 2013, the San Augustine turf grass has been replaced with Delta Bluegrass Company’s “Mow-Free” California Native Fescue (blend of 3 Fescues). 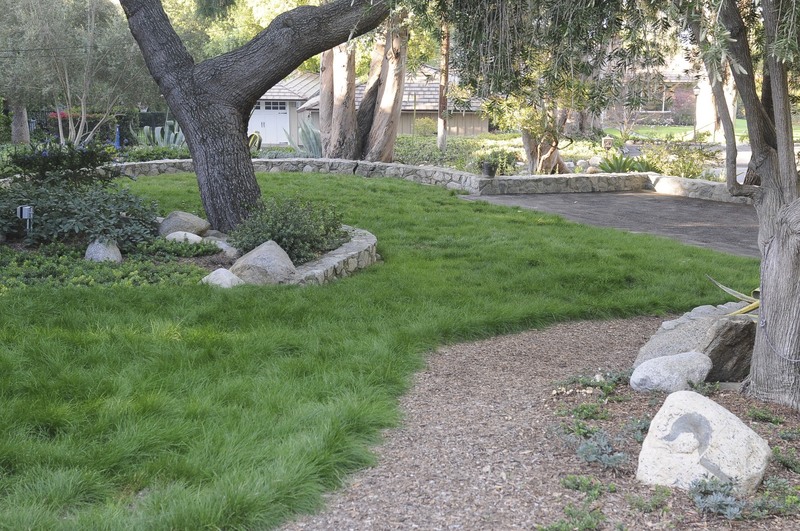 Since installation in May 2012, we have mowed the lawn 4 times (as of April 2013). San Augustine required watering every third day. We now water the grass every 10th day in winter, and every 5 to 6 days during the warmer and drier months. 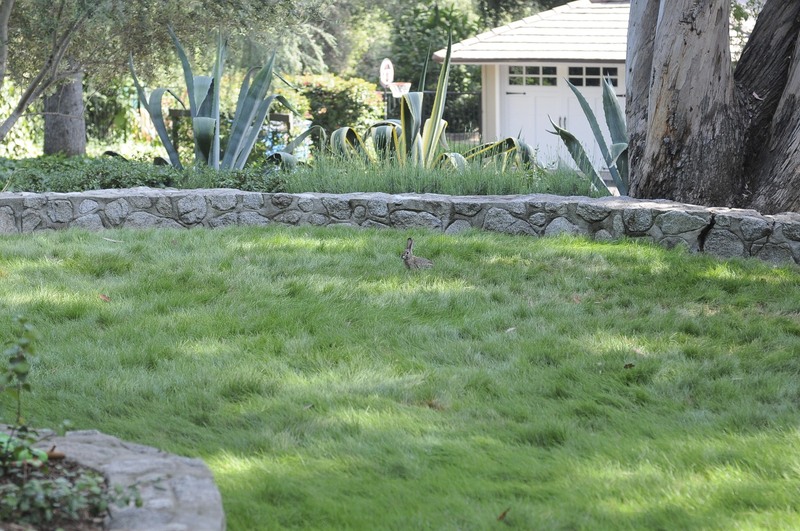 Added benefit — when you add California natives to your landscape, and modify the cultivation practices in your garden, you are inviting other aspects of nature into your gardens — such as this rabbit (look closely). Bears and bobcats have also been observed lounging in the tall luxurious grasses. 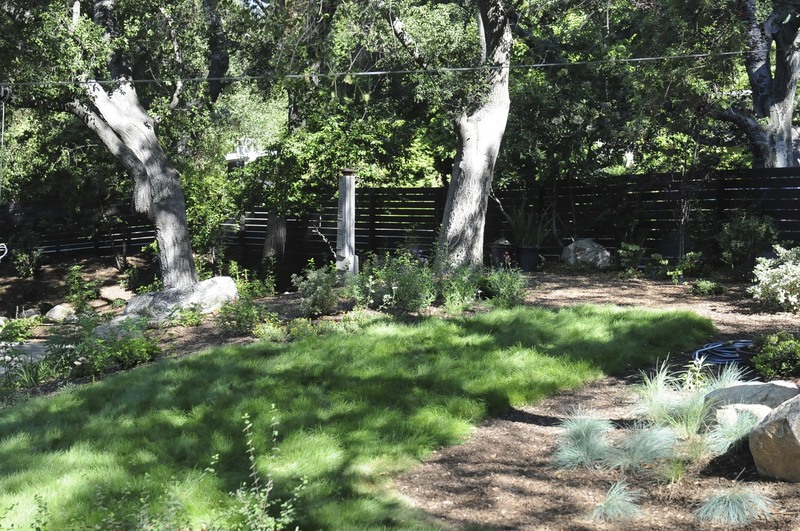 Final thought — we recognize that the “natural” look is not for everyone, and the San Augustine that preceded the long grass is more in keeping with the formality of most gardens — its a tradeoff. We have simply embraced the lower water, lower maintenance, more nature friendly approach — but that is simply our preference. Zones 4 and 5: Another view of the front grass. The low shrub in the center of the photo, next to the pine tree’s trunk is the Sunset varietal of Manzanita (Arctostaphylos ‘Manzanita’). See the Manazanita Mania post for more information on the manazanita collection. 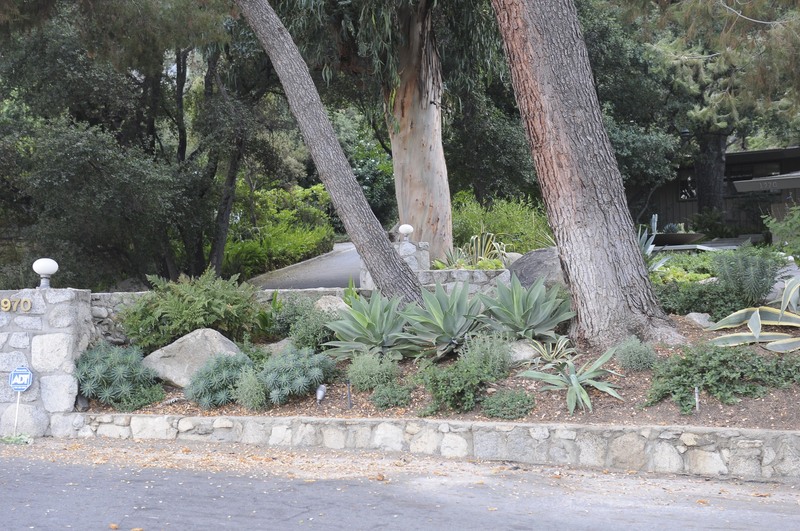 To the left of that shrub, the ground cover (brighter green in front of the rock and electrical outlet is another manzanita – Arctostaphylos ‘Carmel Sur’. Zone 10: Looking to front steps after Halloween 2011. In the view (among others): Quercus engelmannii (Engleman Oak) (center), Mahonia repens (barberry) (lower left foreground), Liriope muscari (monocot bladey in midground) , Acanthus mollis, and Acer palmatum (Japanese Maple) (left midground). 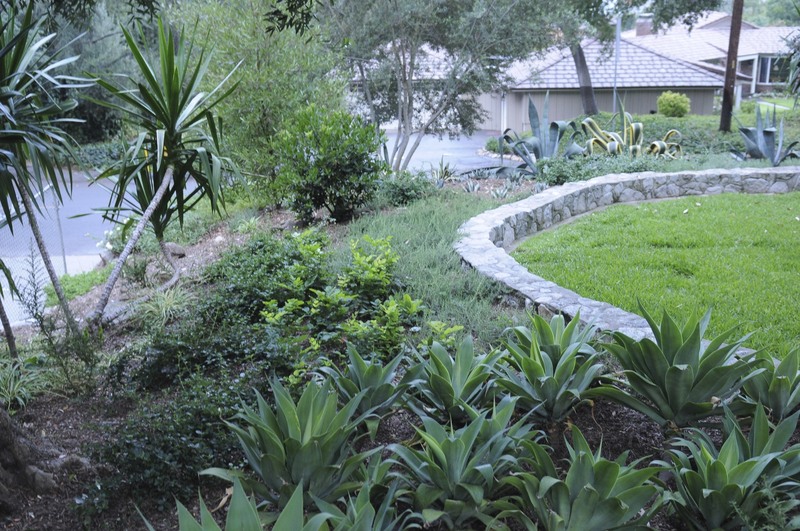 Zone 1(A-C), Street-Side Garden: This garden is a “sampler garden” containing many of the plants on the property, including Agave attenuata, Ceanothus, Agave americana, Agave americana var. marginata, and Olea europaea ‘Little Ollie’. The garden faces south to southwest. Zones 22: Human interference with nature! 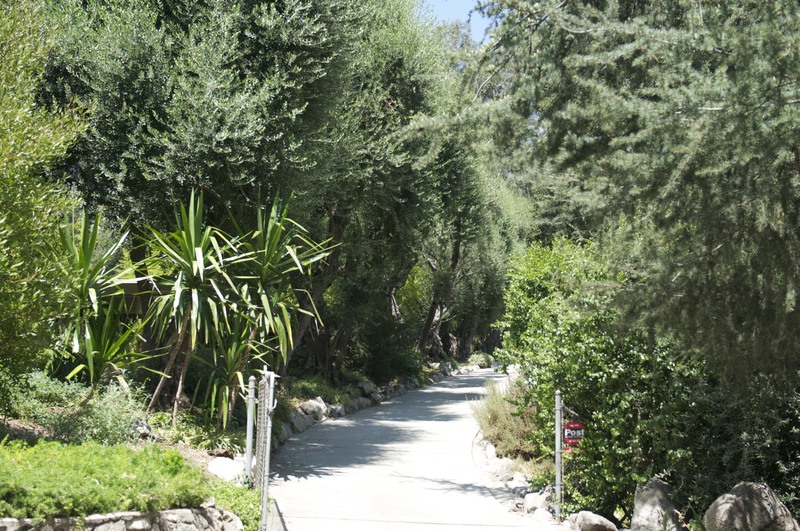 Zone 4: Looking to the driveway and street, wonderful structure of this older Callistemon viminalis. 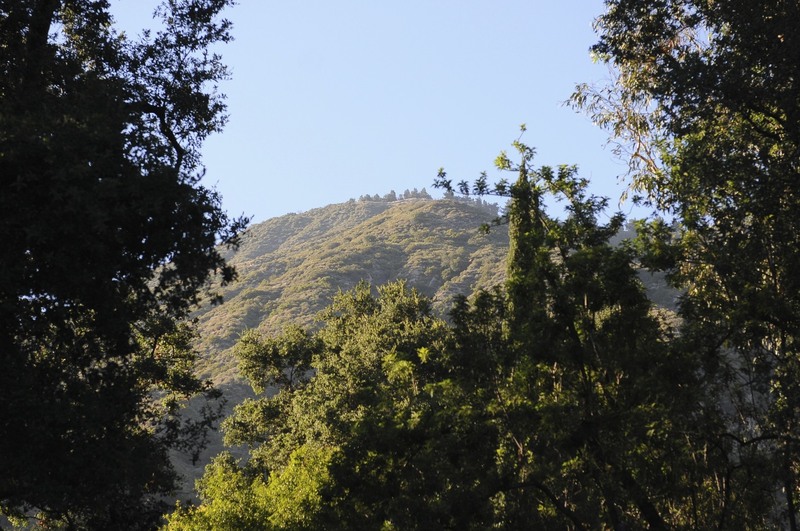 Zones 3 through 7: The understory of the Pinus halipensis (Aleppo Pine) and Acer palmatum (Japanese Maple, to the left)) contain Arctostaphylos ‘Sunset’, Arctostaphylos ‘Point Reyes’, Rhamnus californica (coffeeberry). 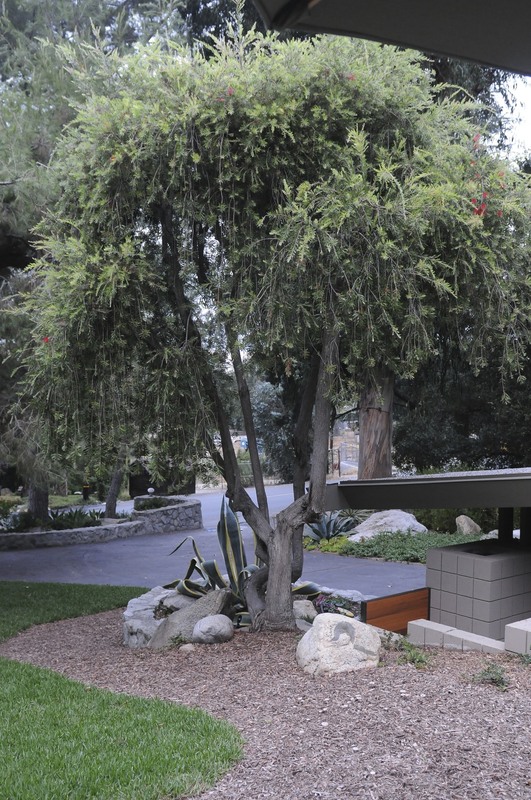 The fountain was made by Malibu artist, Tory Williams. 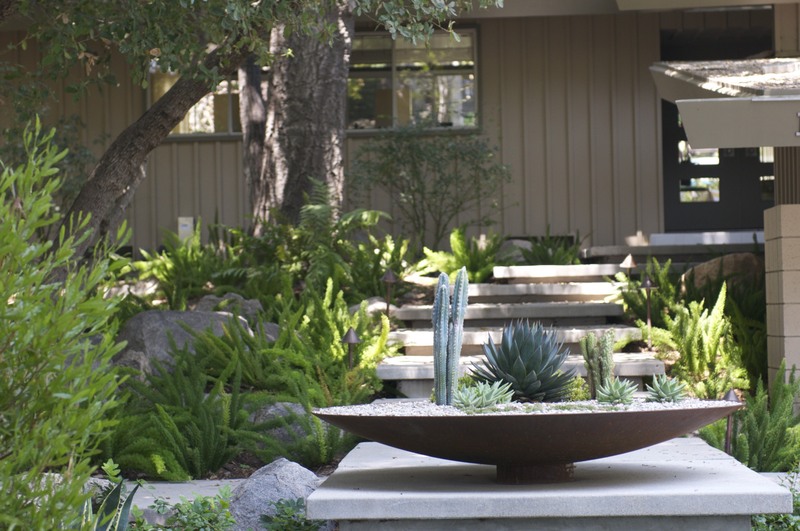 Zones 8 and 9: Succulent bowl and steps leading to front door of the house. Eastern boundary of Property: Lined with Olive trees approximately 50 years old. The Yuccas are yucky and have recently been removed. Zone 13: This is the oldest oak on the property. Its trunk is approximately 4 feet in diameter. The next photo shows the woodland planting (different perspective) that followed a year or so after this photo was taken. 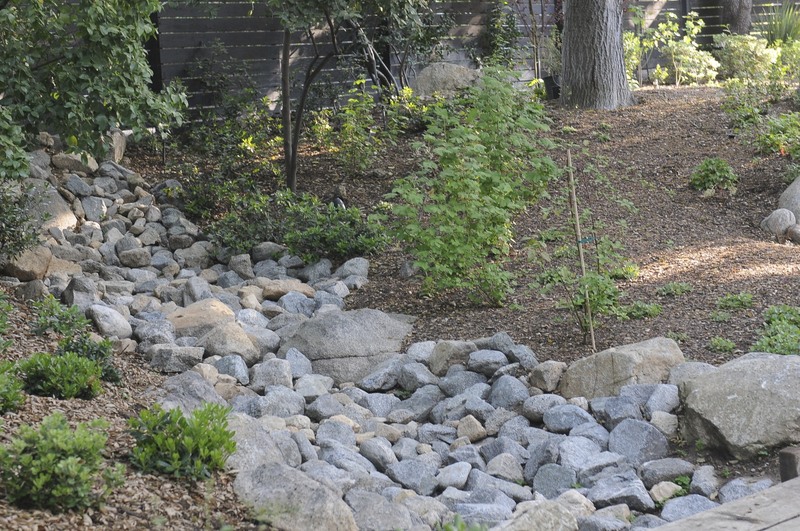 The dry riverbed (natural, with a bit of restoration by us) — with currants (Ribes malvaceum and Ribes sanguineum var. glutsoninum) and coffee berry (Rhamnus californica) in the background. 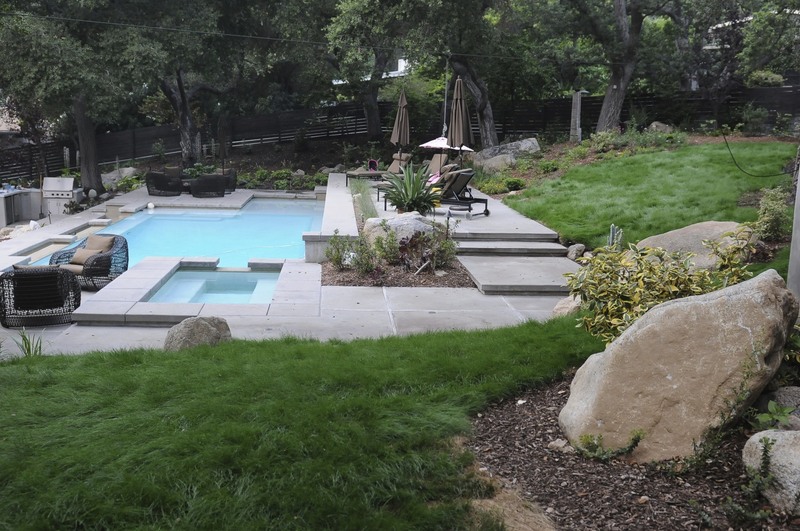 Zones 14 to 16: Upper back lawn, above pool. We are blessed with the oaks. 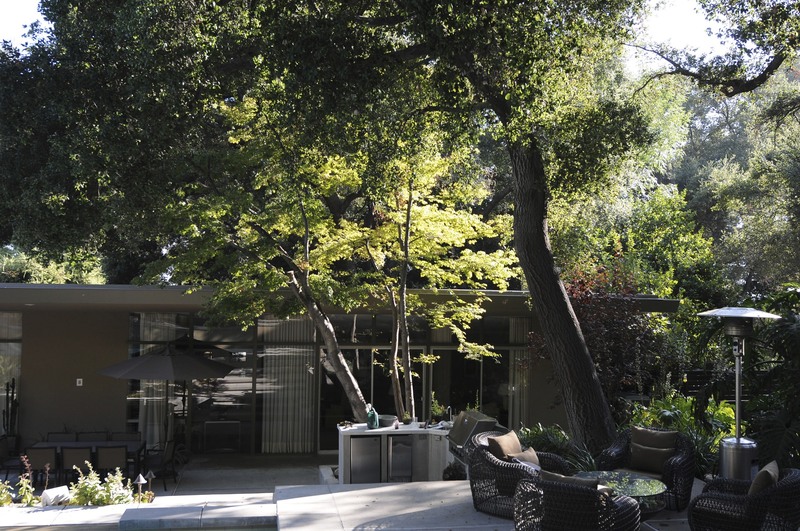 Zone 12: Japanese maple side-by-side with large oak, looking from above the pool to the house. The Pool: Looking to Zones 20 to 22. Zones 12 (upper) and 24 (lower): This is the main back planter beds adjacent to the back patio closest to the house. 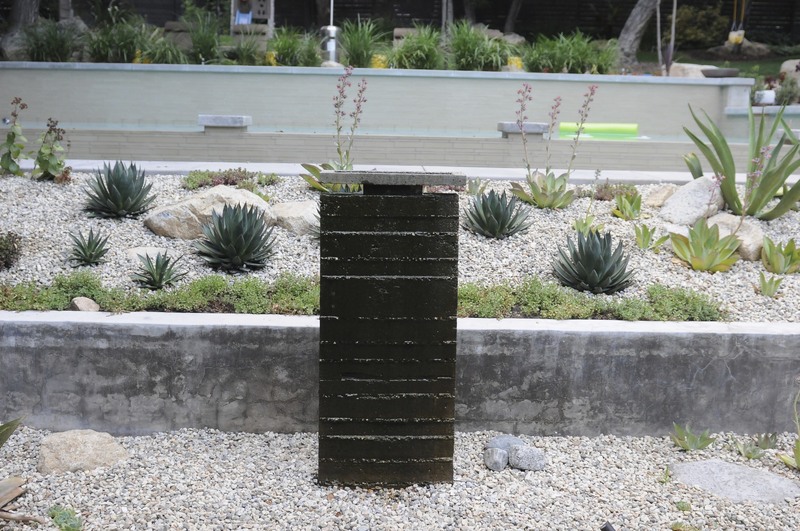 The fountain was designed and constructed by Tory Williams. Zone 23: The bamboo grove adjacent to the outdoor shower and bath area. 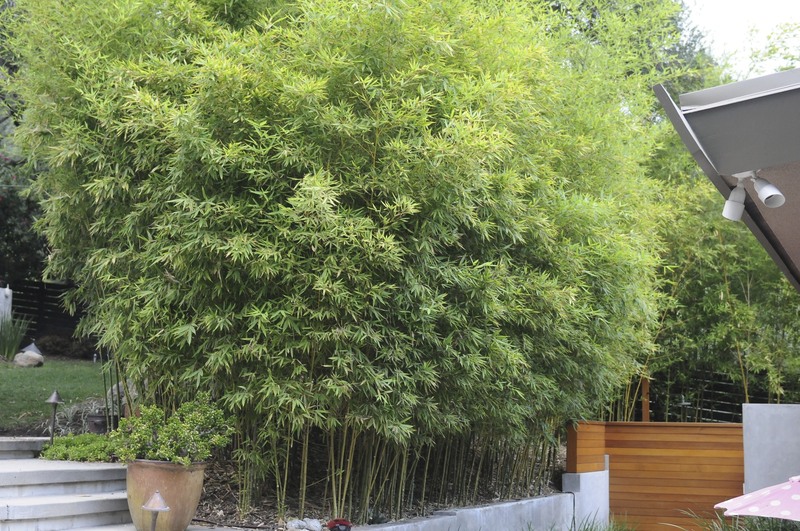 These are running bamboo and require constant maintenance to keep them from spreading! 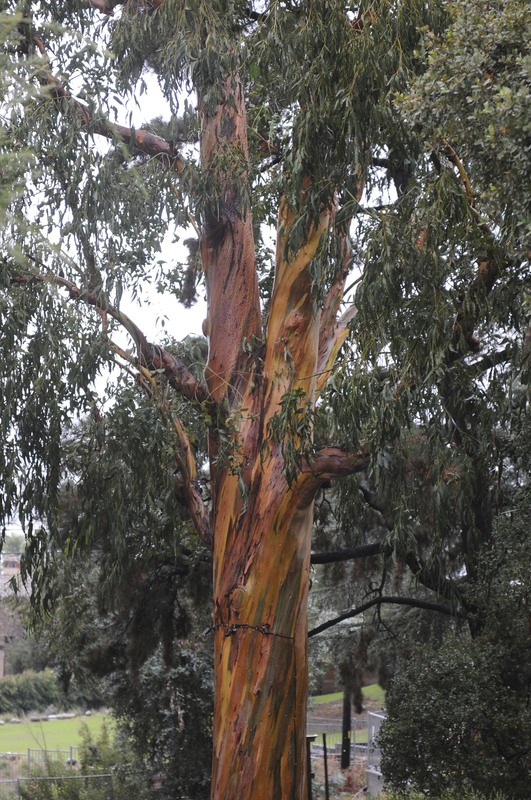 Zone 9: Eucalyptus — approximately 100 feet tall. The view from the back yard on a beautiful spring day.